I got home on the evening of June 7 and planned to get out the next morning to try to connect with a good bird or two of my own. First, however, I thought I would follow up on the possible Clay-coloured Sparrow that received no further mention on BCVIBIRDS or the rare bird alert. I drove past Quick's Bottom and towards the Vancouver Island Technology Park at around 8:30 a.m. Having just worked for nearly three weeks up in Fort McMurray where Clay-coloured Sparrows are a dime dozen, I was confident I would easily pick out a Clay-coloured Sparrow if it was still around singing. I rolled the window down in the car and cruised along slowly. Within seconds of putting the window down, I heard the distinct "bzzzzz bzzzzz bzzzzz" of a Clay-coloured! The idea of that species being exciting after coming back from a play where they're abundant is somewhat absurd, but this species was long overdue for me in Victoria. Maybe relieved is a better description of how I felt. To put this bogey bird in perspective, let me relate it to Brewer's Sparrow - the other rare Spizella that occasionally turns up in Victoria. 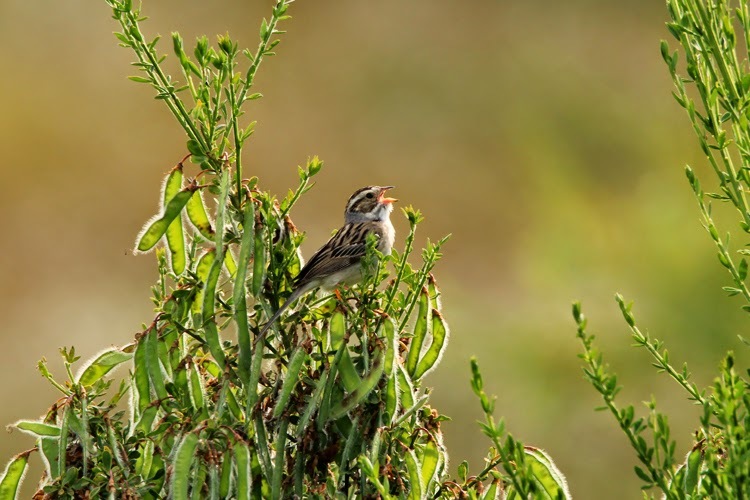 Brewer's Sparrow has fewer than 10 records on Vancouver Island, while Clay-coloured Sparrow has been recorded likely more than 20 times. I have been fortunate enough to see two Brewer's Sparrows in Victoria, thanks to the sharp ears of Ian Cruickshank both times. This unlikely discrepancy is due largely to typical windows these two species show up in the region. Brewer's Sparrow is often found in the spring, and that is certainly the case for the two birds that Ian found that I was able to capitalize on. Clay-coloured Sparrows, on the other hand, typically show up in the late summer or early fall in the Pacific Northwest. I just seem to get unlucky with absences in the fall when Clay-coloured Sparrows show up. Lucky for me, this Clay-coloured Sparrow decided to break the mould and set up a territory on a tiny shrub-dotted knoll in Layritz Park! I am not sure how much content I actually post on my blog about the actual "art" of birding, but I think the above qualifies as a little tip for modern birding. Do whatever you can to document a bird. There will always be cases where a bird legitimately can't be well-documented, but I think we're getting to a point where the majority of the rarities should have some form of presentable evidence. If you hadn't thought of the above, give it a try with even some regular species. If you need assistance with the conversion of your movie file to audio, drop me a line and I'll see if I can walk you through it. I am new to this, too, but it is a rather effective way to document a bird that is very skulky, but regularly vocalizes. For example, what if by some outlandishly glorious twist of fate you found a Yellow Rail giving its "tick-tick... tick-tick-tick" calls from a wet meadow on southern Vancouver Island? Do you think you're going to see it and get photos of it? Maybe you can lure it out with playback and get lucky, but probably not. I would now be inclined to switch my digital camera to video mode and start recording in hopes that it picks up the calls. If you don't think documenting rare birds is important, you should have a read through a very recent piece on the ABA blog by George Armistead by clicking "here".... here. That was a weird way to do that. Anyways, don't take that article personally. There will always be birders that don't understand that we all get something different out of this hobby. I find it very helpful when rare birds are documented and I am grateful when I receive an e-mail about a rarity that is accompanied with some sort of tangible evidence. Do I really care if someone hasn't photographed a vagrant? In the end, no... not really. Depending on whether it's the first documented record of that species in the province or even in the local checklist area, it may or may not get accepted due to a lack of proof. That doesn't mean it didn't happen, but rather it greatly diminishes the critical evaluation of the identification by a records committee. Okay, that's all I plan to say about that because I have now strayed off topic farther than the Clay-coloured strayed to end up in Victoria. Let me just wrap this up with a little update. First, the bird is still, as of June 11, singing up a storm by the small rocky knoll at Layritz Park near the Vancouver Island Technology Park. And finally, the Clay-coloured Sparrow was the 293rd species for me in the Victoria checklist area. I am still clawing my way up towards 300 and hopefully I'll be able to inch my way up a little more this year. This and Say's Phoebe were two species that continually sat in my top 5 next expected birds to be added, so I'll have to revisit that list and adjust it now that they're knocked down. Feel free to help me out by timing your rarity discoveries with my arrivals back in the Victoria area! Lark Sparrow, Dusky Flycatcher, and Grey Jay are my top three, so I just need to think about what's next after that. Maybe Pink-footed Shearwater and Long-tailed Jaeger? Yes... consider that a wish list.